Special note! If you are asked during registration if you want to be an Individual or Join a Team, choose Join a Team. You want to be on Team Valpo. It’s a redundancy in the system that has been discussed with the developer. Sorry about the inconvenience! THIS MAY 4, CHANGE A LIFE. Join thousands of people across the globe in our mission to bring life-changing clean water and fullness of life to children in communities around the world. 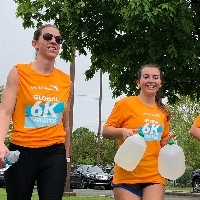 Walk, skip, run, or push a stroller with us at the World Vision Global 6K for Water on May 4, 2019. Each registration provides lasting clean water to a child, like the child on your race bib! Whether you show up with a light saber for "May the 4th be with you" or in a sombrero for Cinco de Mayo Eve, we'd love to have you join us! We'll start and end on the south side (Evans Ave) of Old Fairgrounds Park, right next to Butterfield Pavilion. Show up anytime after 9:00 am to sign in & grab a banana or handful of Oreos to fuel your walk or run. :) Five laps around the park = 6k, which is the average distance people have to walk to get dirty water in the areas served by World Vision's water efforts. But you can change that! Every step you take is one they won't have to anymore! We can't wait to see you on May 4!